It’s worth noting that I’m not alone in my love — three starred reviews and an average of slightly more than 4 stars on Goodreads has me in good company. And there’s a lot here to admire and respect as well as love. So enough squee, and on with the thinking. Language, theme, and character are where this one shines. World building is where it falters, and I’m still deciding how much that should matter. There’s an almost stilted quality to the narrative. Sentences are short, seemingly straightforward but actually playing hide and seek with complexity; a lot is said without words, and it takes significant skill to do this kind of showing without actually showing anything in some scenes, or by only giving the actions without pandering to the reader by describing emotions or thoughts in too much detail — a skill that is critical in a narrative where the characters are often untruthful with themselves. Occasionally the language soars — a fire “chittered”, Ronan “slunk against” a couch, a nonstandard use of slinking but one that gives a sense of his gracefulness and his slight tendency towards smarm. Late in the book, Kestrel winds through a room. 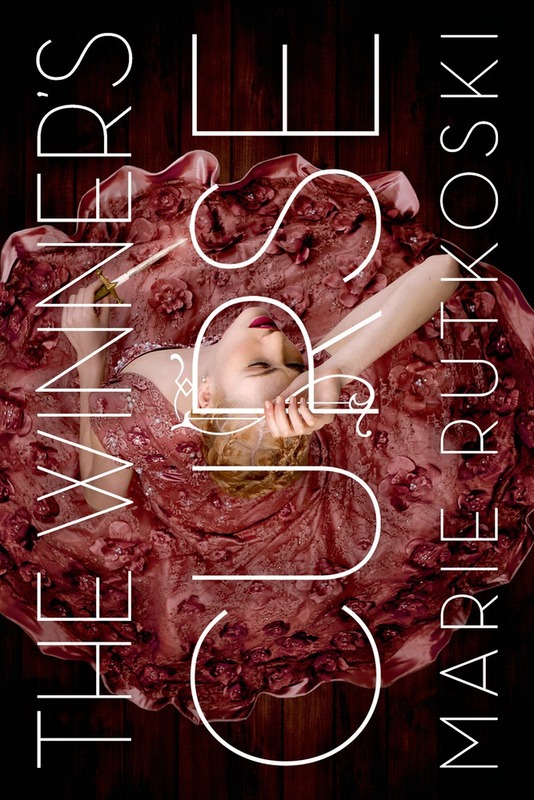 Another author would have her walk, or pace, but Rutkoski has a flair for words that describe more with less. Thematically, too, there is much to chew on: this is a tale of the aftermath of war, and then of war again, of the ways people are changed and the way cultures and customs clash against each other. Kestrel’s accustomed and often thoughtless privilege combined with her ambivalence and even discomfort are rendered in her every action and in the things she says and the things she doesn’t say. Her growing attraction to Arin seems almost inevitable; she has been raised in a Herrani house, by a Herrani nurse — of course a handsome young man with a similarly privileged background would attract her, and of course her love for things that the Valorian’s consider soft but the Herrani value plus her anger at her father would attract her to the forbidden. It’s the opposite of the insta-love so often decried in YA; it might not even be love, but it’s a complex, fragile, destructive relationship that comes across as completely true to Kestrel’s character. Have I convinced you that this one has legs yet? I’ve nearly convinced myself, but then there’s that pesky world building. It’s not terrible, and there are some details that are great. But the ancient world–Regency mashup has me constructing histories that get us to this point, and it doesn’t add up; if the Valorians are all military might (marriage or military by age 20 is mandated), where do all these sparkly dresses and parties and flirtations fit? If they are so without culture of their own (which is an oft repeated truism; the Herrani have all the medicine, poetry, and music), how do they have, for lack of another word, so much culture? (And if they are all about war, how have they not figured out medicine, or at least kidnapped Herrani doctors and learned from them, already?) Why did the Herrani surrender to slavery? These were countries with relationships and trade; how did that become conquest so quickly? Some of this is addressed but not with enough depth to make it make sense, and some of it is ignored. None of it bothered me on the first read, but on the second go I found myself with a LOT of questions. And did I mention first in a series? Some of my questions might be addressed down the line, but I’m only looking at this book. I’ve still got my scales tipping back and forth. My gut says it doesn’t have a chance, but there’s some strong stuff here that rivals the top of the crop. Or am I just blinded by love, much like Kestrel, who pushes aside her qualms and suspicions because she’s got all those tumultuous feelings getting in her way? To be blunt, I think that this one won’t hold up. The writing is strong on a sentence level, and I found Arin and Kestrel’s romance surprisingly convincing. I agree that Arin’s characterization, especially since his position in the Herrani resistance is so focused on him being a natural leader, is more than a little flat. It didn’t completely turn me off the story however. On the other hand, I had so many questions and issues on a first read, the kind of worldbuilding questions you note, Karyn. But my main objection boils down to the fact that it all seems too easy. Revolutions are messy, as both history and current events show us. This one isn’t: it feels planned and contained in a way that made me question it. It makes me disbelieve in the whole story because the faults in the worldbuilding turn into faults in theme and character as well. As a reader, I’ll try the next book in the series, but for the Printz, I just don’t see this one being able to make it all the way. Which is a pity, because I think it had a lot of potential to be amazing. Yes! Maureen, you are totally right, and you’ve put your finger on something that was nagging at me. It wasn’t bloodless — there are hints that lots of people died — but there’s a weirdly sanitized feel to the war of 10 years ago and the Herrani are, by and large, more well adjusted than they ought to be. Except maybe Cheat. It’s a war that had to have happened for the rest of the story to happen, but it feels like a device more than a fully fleshed out piece of history, right? Yes, exactly! And since that’s the background for the whole story, if that falls short, then it really undercuts the strengths of the book. I agree this one has a lot of potential, and I had a lot of fun discussing it, too, because it’s detailed in an interesting, exciting way. But I also agree that there are problems with the worldbuilding, which doesn’t really hold up to close examination. I thought Kestrel was a very good character – though I did wonder how she, of her entire culture, came to be bothered by the idea of slavery – but I wasn’t as sold on Arin. I thought he was inconsistent, and I didn’t buy his relationship with Kestrel (beyond seeing her as his equal, because that did make sense). There were hints that others felt some discomfort, like Jess; maybe we needed more of the larger world. Is slavery common? Are there no free Herrani in the farms in the countryside? In fact, do all people live in one of the two cities? Ok, the larger world building is deeply deeply flawed. I’m Kestrel at the end, with the scales fallen from my eyes.